Northeast. The territory that used to belong mainly to Dzerzhinsky and Smolninsky districts and in some small part – to Kuibyshevsky one. In spring of 1986 here in the “House of Journalists” a city championship was held (1. Solozhenkin). It was a round robin tournament, in which 16 masters took part. Later 10 of them were to become GMs. «Soviet of Commissars of the Petrograd City Commune has ordained to close all the clubs and assemblies where the games of cards, lotto etc. have taken place… In case of founding out the games of cards, lotto etc. going in the above-mentioned places their owners are to be arrested and taken to Extraordinary Commission to be prosecuted. The guests, who have been caught at the game or on the premises where the game has been held, will be taken to the EC for identification and confiscation of all the money on them to the profit of Petrosoviet. Commissar for Internal Affairs M.Ouritsky». Possibility of broad interpretation of this ukase could have aroused some anxiety among the chessplayers. But at first they had encountered no particular problems. «On April 28th in Petrograd Chess Assembly (Nevsky Ave. 72, turn right in the courtyard, 3rd floor) B.Ye.Maliutin will give a simultaneous à l´aveugle display against 12 –15 players. The display starts at 1 o’clock in the afternoon» («Evening lights», April 23, 1918). But in summer the situation became more complicated. “ Due to the requisition of its premises Petrograd Chess Assembly has been compelled temporarily to move to a private apartment: Liteiny Ave. 46, apartment18, in the courtyard. The game takes place daily except for Mondays...» («Evening lights», June 20, 1918). «Yesterday, on November 26, a subscription dinner for the benefit of Messrs. Steinitz and Pilsbury was given… In Prince Yusupov’s luxurious house on Nevsky Avenue 40 persons were present: Sabourov, Chigorin, Schiffers, almost every Petersburg chessplayer of 1st category and other chess-lovers...» («Petersburg Gazette», November 27, 1895). In a few days one of the most significant competitions of the XIXth century has begun here: a six-round tournament match of four best players of the world (1. Lasker, 2. Steinitz, 3. Pilsbury, 4. Chigorin). In 1920th “Prince Yusupov’s luxurious house” had become a “Palace of Art Workers”, and its residents invariably favored the worshippers of Kaissa. In December 1925 German Grandmaster F.Saemisch (1896 – 1975) gave here a blindfold simultaneous display on 12 boards with the result +5 -4 =3. Among the winners was a future master L. Shamaev. Of the later events we can recall an international “A.A.Kotov Memorial”, that has been staged here in the summer of 1984 г. (1. Gavrikov, 2. Salov, 3. Sveshnikov). Here M.M.Botvinnik spent his childhood, adolescence and youth. Speaking of the 6th Champion of the World’s biography, on the stage of his ascent the most impressive period had been a short space of time from 1930 to 1933, when he managed to won seven tournaments in a row, including two city championships and two USSR championships! And at the same period of time he began his post-graduate study, having finished his course in the Polytechnic Institute. «..We used to live with my mother, my brother and his wife in a large communal flat (seven families in nine rooms) on the Nevsky» (M.M.Botvinnik, «Reaching the Goal», 1977). In this house lived M.S.Kogan (1898 – 1942), an author of several rather important books on the history of chess in our country. In this house lived R.G.Kizeritsky (1875 – after 1930), a piano tuner, who had taken part in the tournaments of the best St.Petersburg chessplayers in 1902 and 1912, in the All-Russia Tournament in 1907, from which he has retired after 5th round, and in Petrograd championships of 1920 and 1922. In his early youth here lived G.M.Chepukaitis (1935 – 2004), a master who used to take place in many a championship of the city, sharing the 5th and 6th place in 1967, a senior Russia champion of 2003, a unique blitz player, a 6- times absolute winner and many times prize-winner of the city blitz championships, an author of the book “The Chessboard Sprint”. In this house lived GM V.A.Alatortsev (1909 – 1987), a runner-up of 1933 USSR championship, a 1934 champion of Leningrad. After having moved to Moscow he shared the first place in 1936 and 1937 championships of the capital and in the Trade Unions’ Championship of 1938. In the end of 1950th he was the head of the USSR Chess Federation. He was an author of some books on methods of teaching chess, Candidate of Pedagogic Sciences. Here lived L.I.Volpert, USSR Ladies’ Champion of 1954, 1958, 1959, a frequent prize-winner of the USSR Championships and a prizetaker of the Candidates Tournaments of 1955 and 1959, winner of the USSR Team Championships of 1960 and 1962, the champion of Leningrad in 1964, professor, Doctor of Philology. In this house lived master B.I.Goberman, a runner-up of the USSR Junior Team Championship of 1962 as a member of Leningrad team. Here lived master Ya.G.Feldman (1933 – 2006), a participant of the city championships of 1965 and 1971. In this house lived A.E.Deuel, an international arbiter and chess journalist. In this house lived candidate master G.Z.Leinov, a bronze medal winner of the USSR Junior Team Championship of 1958 as a member of Leningrad team. In the middle of 1950th here the Smolninsky District Palace of Pioneers and Schoolchildren was situated. Occasionally A.A.Chumachenko, a candidate master, winner of the1961 USSR Schoolchildren Spartakiad as a member of Leningrad team, bronze medal winner of the “Trud” Sport Society Junior Championship, used to call on here. Here lived one of the best masters of our country, a frequent participator of the USSR Championships, bronze medal winner of the 1953 Leningrad championship, winner of the 1953 USSR Team Championship as a member of the Leningrad team G.K.Borisenko. In this corner house 10th World Champion B.V.Spassky lived during his school years. In this house lived master E.I. Buchman, a participator of two USSR Championships, prize-winner of 1969, 1975 and 1983 Leningrad championships, winner of the 1966 Students’ World Team Championship. Here lived I.M. Saykin (1900 – 1937), a Young Communists’ league worker, sport chief, Lensoviet deputy and “the enemy of the people”. In the beginning of 1930th he was a head of city chess organization, and his deputies were Ya.G.Rokhlin and M.N.Volkovyssky. The last address of GM A.K.Tolush. In that house also lived a first Soviet Ladies’ World Champion L.V.Rudenko. There lived master V.I.Ivanov, participator of a few city championships (shared 5th and 6th places in 1976). Here lived GM Ye.A.Solozhenkin, city champion of 1986 and 1998, Russia champion of 1992 as a member of St. Petersburg team. The Tavrichesky Palace. According to a legend, the first owner of the Palace, Prince G.A.Potiomkin (1739 – 1791), gripped by his passion, used to spend hours playing chess («And playing chess with his one hand he conquers nations with the other»). Next subject is the State Duma in 1906 – 1917. Some rather famous deputies (L.A.Velikhov, G.G.Zamyslovsky, N.N.Koutler, P.N.Milyukov) are not indifferent to chess, and the Duma chancellery official B.Ye.Maliutin is always ready to play «à l´aveugle». «Great» chess were to visit the Palace later; in spring of 1941 г. the first part of the tournament match for the title of Absolute USSR Champion had been held here (1. Botvinnik, 2. Keres, 3. Smyslov). It so happened that the Tavrichesky Garden has always been less popular among the chessplayers than the Central Park of Rest and Culture or the “Rest garden” on the Nevsky. But still there used to be a chess pavilion, where Yugoslav GM V.Pirc (1907 – 1980) had given a simultaneous display in summer of 1957. GM G.Sosonko was also known to frequent this garden during the earliest stage of his playing career. Here lived GM V.V.Epishin, bronze medal winner of the 1991 USSR championship, 1987 champion of Leningrad, winner of the 1992 country team championship as a member of St. Petersburg team, winner of the 1991 World Junior Championship as a member of the USSR team. One of the most recent points on the chess map of St. Petersburg. In 2006 the city chess federation office moved there. In this house lived for a long time A.M. Batouyev, the Merited Coach of Russia, a splendid teacher and chess master, prize-winner of 1945 Leningrad championship, a musician by education, a zoologist by vocation, an author of some books and a head of two largest young naturalist clubs of the city. He had been mentioned more than once in the course of our past walks. Here lived V.M.Lutze (1874 – 1938? ), winner of the 1904 Petersburg Chess Assembly tournament. What do all the chessplayers named below have in common except, naturally, the GM rank? Boleslavsky, Shamkovich, Krogius, Taimanov, Polugayevsky, Gufeld, Kozlovskaya, Sosonko,Tseitlin, Razuvaev, Gulko, Karpov, Levitina, Kochiyev, Yermolinsky, Azmaiparashvili, Elvest, Alexandria, Salov, Epishin, Khalifman, Kamsky, Sakaev, Svidler, Alekseev. The answer is simple. Every one of them used to climb the stairs to the second floor of this house to the fabulously hospitable apartment of G.Ye.Nesis, Merited Coach of Russia. In this house lived master V.K.Lyavdansky, participator of two USSR championships, bronze medal winner of 1964 and 1969 Leningrad championships, a runner-up of 1969 USSR team championship as a member of the Leningrad team. Here lived maestro A.A.Levin (1871 – 1929), who in 1900 and 1902 had shared with M.I.Chigorin the first place in the tournaments of the best Petersburg players. A large house, facing three streets an once. Once on the first floor of this house there was a communal flat No. 29, tenants of which had been settled apart long time ago. It was inimitably re-created by Genna Sosonko in his books (an essay “Two lives” and other works). A twice champion of the Netherlands, prize-winner of 1976 and 1988 World Chess Olympiads, winner of several international tournaments, GM Sosonko left this flat in August 1972. By this time his service record looked a bit different: a master, one of the winners of 1971 “Spartak” sport society championship, participant of 1967 USSR championship, winner of 1958/59 city championship for schoolchildren. In this house lived candidate master A.V.Perelygin (1910 – 1981), winner of the blockade tournament of 1942, bronze medal winner of 1944 Leningrad championship. Most of his life in Leningrad V.L.Korchnoi spent here: blockade years, school No.203, Palace of Pioneers, History faculty of Leningrad State University, first big successes. In this corner house lived master A.F.Maltsev, a runner-up of the 1981 city championship. Here lived master A.L.Ioffe, a runner-up of the 1969 USSR team championship as a member of the Leningrad team. In 1920th in this house lived G.A.Goldberg (1908 – 1976), master, a participator of two USSR championships. Much later in the same house lived M.B.Pukshansky, a participant of two Leningrad championships (he had shared places from 5th to 7th in 1978), Merited Coach of Russia. In 1905 there lived a teacher of grammar school No.10 V.A.Krogius (1876 – 1942), one of the active chess figures of his time. In Soviet period he became a professor of mathematics in the A.I.Gertzen Pedagogical Institute. He was grandfather of GM N.V.Krogius. In the second half of the last century in the same house lived GM A.V.Kochiev, 1975/76 USSR Junior Champion, the1980 and 1981 Junior World Champion as a member of the USSR team, winner and prize-winner of a number of international championships. In this house lived one of the leaders of Petersburg Chess Assembly Yu.O.Sosnitsky (1878 – 1919). For many a year an address of a most chessplaying family of our city. T.A.Sakaeva (1946 – 2004), bronze medal winner of 1968 «Burevestnik» sport society championship, Merited Coach of Russia; R.A.Sakaev, candidate master and candidate of Engineering; their children: N.R.Sakaeva, candidate master, a participant of several city championships; GM K.R.Sakaev, the 1990 champion of Leningrad, USSR junior champion of 1990, 1990 and 1992 World Junior Champion, 1999 Russia champion, as a member of the Russian team winner of 1991 World Junior Team Championship and of the 1998 and 2000 World Chess Olympiads, a 2006 Russia Cup winner…and that is only a shortlist of his achievements. During the M.I.Chigorin Memorial Congress of 1909 in this house lived one of the winners of the major tournament, a great chessplayer A.K.Rubinstein (1882 – 1961). In the second half of the 1920th in this house there was the editorial office of the “Shakhmatny Listok” (“Chess Leaflet”) journal, the first issue of which had been published in fall of 1922. The book warehouse of the publishing house bearing the same name was also situated there. In fall of 1945 here in the “I.V.Stalin Road Engineering House” the ladies’ city championship took place. The winner was V.M.Borisenko (Belova) (1920 – 1993). In December 1945 Valentina Mikhailovna became the USSR champion for the first time. Altogether she has managed to win 5 USSR championships (and it is a record) and 7 Leningrad championships (it is the second result). The outstanding chess teacher, author of several books, who had been heading the Palace of Pioneers’ chess club for many years, the Merited Coach of the USSR V.G.Zak (1913 – 1994) lived here till the middle of 1960th. Dozens of his pupils are well known in the chess world, and the most famous being Spassky and Korchnoi. It is the address of the Kuibyshevsky District Palace of Pioneers and Schoolchildren. One of the chess society teachers was master E.V.Barkovsky (1946 – 1991), a participant of several city championships, the winner of the 1983 USSR trade unions’ mass championship. The last Petrograd address of the Sabourovs family. P.A.Sabourov (1835 – 1918) was a noted diplomat, an ambassador to Berlin in 1879-1884, then a senator and a member of the State Council, a honorary chairman of the Petersburg Chess Assembly and of the Russian Chess Union. His son P.P.Sabourov (1880 – 1932) had been the chairman of board of the Petersburg Chess Assembly in 1908-1909 and in 1911-1912, and in spring of 1914 was elected the chairman of the Russian Chess Union. Their apartment in this house had become the last refuge of the Chess Assembly, and in summer of 1918 the Assembly managed to stage a first category tournament there (1.Golubev). In November, 1933 here had been opened the first Central (neither departmental nor trade union!) chess club, which later was to host many various competitions, among them the 1934 Leningrad championships for men (1-2. Alatortsev, Lisitsyn) and ladies (1.Ageeva), the 1934/35 USSR championships for men (1-2. Loewenfisch, Rabinovich) and ladies (1.Semyonova-Tian-Shanskaya), ladies’ city championships of 1935 г. (1. Lobanova) and 1936 (1. Rudenko). This address is also connected with the last visit of Capablanca to our city: on June 12, 1936 he gave a lecture there. In February 1937 the club has moved to the building it occupies nowadays. In this corner house lived A.T.Klimenko (1894 – after 1942), the chairwoman of the first ladies’ chess commission of our city, a participant of the first Leningrad championships and the author of the earliest vivid publications about ladies’ chess. For more than half a century this has been an address of master I.Ya.Blekhtsin, a prize-winner of 1959 USSR junior championship, 1960 champion of the USSR as a member of our city team, a runner-up of 1962 Leningrad championship, Professor, Doctor of Geography. In this house lived an outstanding checker-player and quite a strong chessplayer, a participant of 1943 (shared the places from 4th to 6th) and 1944 Leningrad championships V.A.Sokov (1912 – 1944). Here lived master A.M.Yuneev, 1989 Leningrad champion as a member of “Plastpolymer” team, winner of 1985 USSR championship for clubs, a prizewinner of several international tournaments. Here lived a prominent railroad engineer P.N.Dumitrashko (1867 – after 1935), who was a member of P.A.Stolypin’s Cabinet of Ministers in 1909. He was a chess-lover and helped the Petersburg Chess Assembly as much as he could. 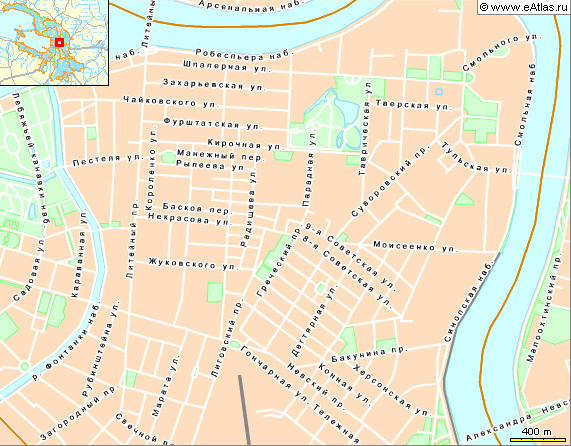 In 1950th Dzerzhinsky District Palace of Pioneers and Schoolchildren moved here from the Moyka Quay. As distinct from the Smolninsky one it exists even now, bearing the name of “Preobrazhensky” House of Children and Youth Creative Work. And, as before, in the fabled times of Batouev, there is a chess society working in this small three-storied house. Sometimes district chess competitions are held here. In 1914 here lived A.A.Chepurnov (1871 – 1942), a participator of many a city tournaments in the beginning of the last century, champion of Finland in 1922 and 1928. The Officers’ House chess club was undoubtedly the most significant of all the now vanished ones. At different time the “keepers of the hearth” here were masters Shamaev, Khavsky, Buchman; Karpov, Furman, Levitina, Karasev, Tseitlin, Yermolinsky and many other good players had been the members of its team. Speaking of the competitions that has been held here it is necessary to begin with 1924, when Bogoljubow has won the match against Romanovsky 8:4. In November 1937 the last 13th game of Botvinnik – Loewenfisch match was played here; having won it, Grigory Yakovlevich equalized (5:5). In both cases on the stake was the title of the USSR champion. In fall of 1945 the first post-war Leningrad championship was staged here. It was a round robin with 23 (!) participants (1. Ragozin). In June 1971 in this club the team city championship took place (1. “Spartak”, 2. “Burevestnik”, 3. “Trud”). And, naturally, in the luxurious interiors of this house a great number of army tournaments have been held – not only on the city level, but also on the all-Union and international ones. In 1920th here lived A.V.Bobrishchev-Pushkin (1875 – 1937), theater-lover, man of letters and participant of several Petersburg Chess Assembly tournaments. In this house lived professor A.A.Smirnov (1883 – 1962), Doctor of Philology, translator of foreign chess literature into Russian, author of the book “Beauty in a Chess Game” and a 1912 champion of Paris. Here lived candidate master A.A.Genin (1940 – 2006), a participant of 5 Leningrad championships and a runner-up of the 1959 USSR Nations’ Spartakiad as a member of our city team. Petersburg Chess Assembly had been situated here from fall of 1913 till the beginning of the World War I. This brief period of time contained a lot of memorable events: first Capablanca’s performances in Russia – simultaneous displays and demonstration games against masters; students’ city championship (1. Romanovsky); the 1913/14 All-Russian tournament (1-2. Alekhine, Nimzowitsch); the making of the Russian Chess Union. And, the last but absolutely not the least, the 1914 international tournament (1. Lasker, 2. Capablanca, 3. Alekhine). In 1935-41 here lived M.M.Botvinnik, Grandmaster and order-bearer, the deputy of Lensoviet, absolute champion of the USSR, the World Champion title challenger. In the same house lived master D.O.Rovner (1908 – 1986), prizewinner of the 1937 and 1956 Leningrad championships. Here lived master I.N.Eisenstadt (1919 – 2006), a participant of 6 Leningrad championships, Doctor of Chemistry, professor of the Technological institute. The house of Count Kushelev-Bezborodko (1800 – 1855). Here in 1853 the first officially registered in Russia “Chess-lovers society” was opened. Among the initiators of this club were Count’s son G.A. Kushelev-Bezborodko (1832 – 1870), publisher and patron of arts, and the capital’s leading chessplayers I.S.Shumov (1819 – 1881) and K.A.Janisch (1813 – 1872). Among the visitors predominated Generals, including Military Minister V.A.Dolgorukov, but composer L.F.Minkus (1827 – 1890) and classic of Russian literature I.S.Turgenev (1818 – 1883) should also be mentioned. The Society is to be credited with holding the first city tournament in 1859 (1. Shumov). The sixth tour is over. The people and places to the South of Obvodnoy Channel wait for us. I.Z.Bondarevsky, A.V.Khalifman, A.M.Gorky Palace of Culture and many others. Meet you at the Narvskiye Gates.